S&S Rug Cleaners, Inc. is the premier area rug cleaning and restoration service for Buckhead and Greater Atlanta area. We offer more than two decades of experience in Oriental, specialty, and handmade rug cleaning and care, including comprehensive cleaning, guaranteed pet stain/odor removal, moth treatment, and expert conservation and restoration. S&S is also bonded, fully insured, and offers complimentary rug pick-up and delivery. S&S is Atlanta's only full-service area rug cleaning company that utilizes a state-of-the-art submersion wash cleaning method. This unique hand-wash system implements an advanced, five-step cleaning process and ensures a safe, thorough cleaning of all fine textiles. To date, its technique has out-performed all other systems both in preserving the integrity of the rug and in achieving complete soil/staining material removal. As part of our strategy to grow responsibility, we strive to focus on the conservation of our natural resources. We realize that we utilize a tremendous amount of water to clean rugs and our resources are precious. As a result, we've invested in a 12,000-gallon rainwater collection system. The rainwater is collected and filtered to ensure the absence of debris, dirt, etc. Rainwater is considered a safe source of clean water; it is free of heavy metals from soil and is a soft water source, which is ideal for cleaning. Used in tandem with rainwater are green cleaning agents with near-neutral PH values. These products are made with the safest possible ingredients that pose the least concern among like chemicals. S&S is also exclusively licensed in Georgia to apply MicroSeal Permanent Fabric Protection. Utilized worldwide for more than 30 years, MicroSeal's patented formula is EPA-rated safe, non-toxic and non-allergenic, as well as sun-fade resistant. It protects all fabrics and fibers from permanent stain damage and endures frequent professional cleanings and wear. It also helps prevent mildew, static electricity, smoke density and flame spread. Steve Arroll and Stoney Green, the owners and operators of S&S, welcome the opportunity to introduce themselves to you and will gladly make available references. Please contact us online, email rugcleaners@bellsouth.net or call us directly at 404-355-2126. Your elegant area rugs play a prominent role in your home. Wear and tear over decades or just months can significantly impact your fine rugs. 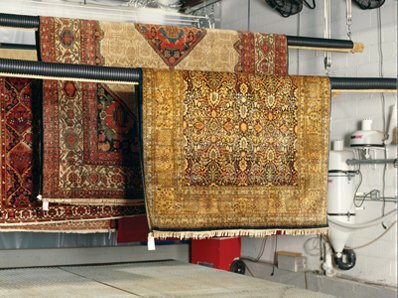 Caring for these rugs requires a special cleaning process to help rugs retain their beauty and integrity. S&S Rug Cleaners has been Atlanta's premier rug cleaning and restoration experts for more than 20 years. Using a state-of-the-art patented washing method, S&S safely, efficiently, and effectively restores the luster and brilliant colors of your rugs. Whether your fine area rug is a fragile antique or a sturdier modern rug, we treat each rug as a treasure and preserve its integrity while completely removing dirt, soils, and stains. Combining this careful, detailed cleaning method with good old-fashioned customer service has allowed us to become Atlanta's most trusted area rug cleaner. We understand and respect the need for special care for your fine area rugs. Put your treasured area rugs in the hands of trusted experts. Call S&S for all your Atlanta rug cleaning and restoration needs. Both of the people that we dealt with at S&S were very professional and friendly, and honest. They repaired our dining room rug quickly, and now it is not even noticeable that there was a tear at one time. Their price for the repair was very fair. We would certainly recommend them for rug repair. Our area rugs were in serious need of deep cleaning including dog urine on some of them. The results of S&S were amazing. The rugs look and smell brand new. Highly recommend their services and we had them back within a week of pick-up!!! !